The constellation of Taurus contains some beautiful molecular clouds and reflection nebulae. 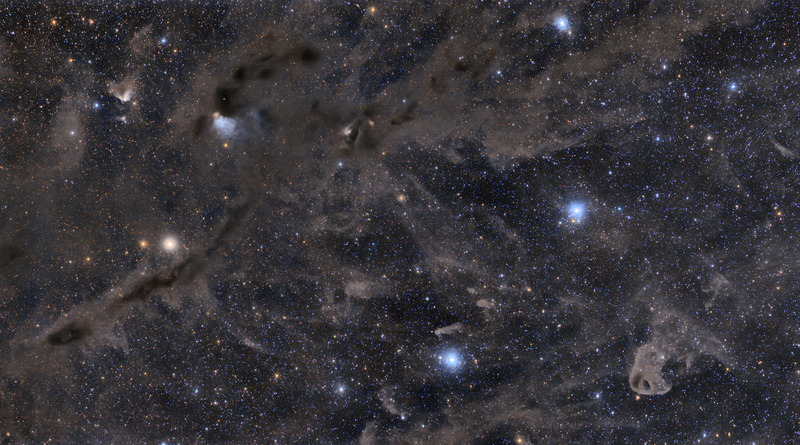 This image shows a 6 x 3 degree section of this cloud which contains several of these dusty nebulae as shown in the annotated version of this image. Most prominent is LDN 1495 (large diagonal dark nebula in lower left), Cederblad 30 (blue reflection nebula just above LDN 1495), vdB 27 (yellowish nebula in upper left) and LBN 777 (the upside down vulture head nebula in lower right corner). Software Used Images Plus 5.75 for camera control. Images Plus 6.0 for calibration, stacking, ArcSinH stretching, Feature Mask, star shrinking and halo reduction, smoothing and noise reduction. Photoshop CS5 used for levels and curves, match color, lab color, cropping and selective color. Pixinsight 1.8 for mosaic merging and histogram streching. HLVG for additional color correction, Gradient Xterminator for gradient removal. Carboni Tools for additional noise reduction and smoothing, Focus Magic for focus restoration. Registar 64 for stack alignment, mosaic panel calibration, and mosaic registration. Notes This image was the culmination of eight nights of imaging, and I'm more than pleased with the final result. I employed a number of new techniques in processing this image, and it helped to be able to pull out some of the very subtle dust in this image. This image was selected for Nasa's Astronomy Picture of the Day for May 22, 2015!!! This image was also published in the Readers' Gallery section of the September 2015 issue of Astronomy Magazine !! !